Perhaps the chirpiness of Chinese New Year ditties pumping out incessantly of each store and neighbour’s home is driving you to create your own music.You don’t have to cash in your hong baos (red packets of money singles collect during the festivities) or head to a recording studio to secure a high quality sound recording. Let Siraj Aziz from hype magazine introduce you to mobile recording outfit Gigasonic. – 3 free platforms to get your works seen or heard by people around the world! Harnessing the power of mobility of the laptop, Hafiz “Jerangkung” Azhiz, 23 (right), Muhd Shahidir, 25 (left) and Muhd “Rizzo” Farid, 21 (middle), founded Gigasonic, a company specialising in mobile recording. 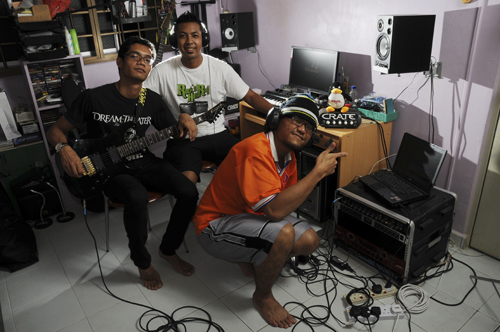 Gigasonic travels around Singapore to jamming studios, homes, public spaces, or any place of your choice, to record. Their choice of transport for roaming the island? It’s none other than the humble Mass Rapid Transit (MRT). The trio literally drag their equipment around the island. With a laptop, microphones, mixers and stands all jammed into their bags, accompanied by a set of headphones fashionably hung around their necks, they roam around various places recording bands not only in studios, but at outdoor events as well. The quality and flexibility of their services reflect their know-how here in the local music industry. 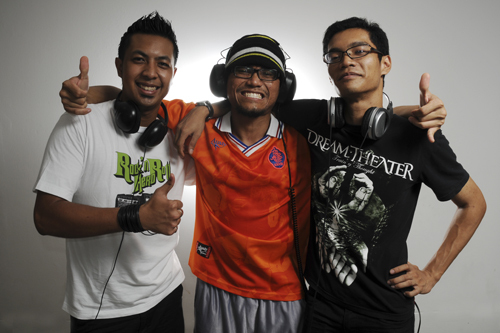 All three members of the team are active musicians and enthusiasts. They’ve played at well-known events such as Wings, in popular Esplanade bar DXO and have track appearances in dramas Metafora and Graffiti on local Malay channel Suria. “To a person, a drumset may sound like any other drumset, but to some, it’s special,” said Hafiz, relating to the personality of each place and instrument. The 3 youths lead very different lives. Hafiz is an IT administrator, Shahidir is a salesman while Rizzo is still studying. What unites them is their spirit in helping local bands move forward. “It’s all about the ‘Gotong-royong’ (meaning “helping one another” in Malay) spirit,” said Hafiz. Gigasonic does this to help aspiring artistes save cost. For those laptop musicians out there, Gigasonic has some tips from you. Hafiz: Maintain your laptop often by defragmenting and clearing old files. Editing software often takes up much processing and memory space. Defragmenting your laptop at least once a month will organise the data on your hard disk, making your computer less sluggish. Shahidir: Researching into finding the most cost effective recording option may be tedious, but when fruitful, Shahidir assures it’s a case of “satisfaction guaranteed”. According to him, many musicians invest heavily but use their instruments and gadgets sparingly. For example, they pay a premium for recording studios with high-end equipment in hopes of sounding good, but fail to realise that they’ve had it in them to sound good all the while. Rizzo: Original software is very important. This was a point that got the other 2 members nodding vigorously. Pirated software, not only won’t give total functionality, it slows down the editing process, as well as hamper efforts of taking your music to another level. The original stuff “doesn’t have to be very expensive,” added Rizzo. Gigasonic recommends that beginners buy value-for-money software such as Cakewalk Studio which costs US$49.90 ($72.30) and Cubase which costs US$99.90 ($144.70), due to the affordability and user-friendly interfaces. Check official product websites for local retailers. After birthing success stories like the Arctic Monkeys and Colbie Caillat, the social networking site has become synonymous with the independent artiste. There are literary thousands of artistes, unsigned or signed, on MySpace. From British art rockers Radiohead to local music heroes The Great Spy Experiment and everyone else in between, almost every artiste on this planet has some presence on MySpace in one form or the other. Signing up is free and you can personalise your page with custom skins that are freely available on the Net. If you’re adventurous or code savvy enough, you can even try your hand at creating your own skins to make your band stand out visually. While not exactly the best platform to upload recorded tracks, given most people use it to source videos, who’s to say that you should stop at just audio files? The biggest video streaming site on the Web was where singer/songwriter Marié Digby caught the world’s (and her record label’s) attention. Her self-recorded video that features the 25-year-old doing an acoustic rendition of Rihanna’s hit song “Umbrella” has garnered over 10 million views since it debuted in mid 2007. A compact digital camera is all you need to do a simple video recording. If you prefer, you can easily extract the lo-fi audio from the clip with the help of video editing software like Apple iMovie or Windows MovieMaker, and then sync in your high quality audio recording instead. Signing up for a YouTube video account is free and the typical time limit for each video is 10 minutes or 1GB in file size. Plenty for you to grab the world’s attention. Way before YouTube or MySpace, SoundClick was already offering unsigned artistes around the globe a home and a easy-to-use platform to showcase their works. Started in 1997, the site offers a myriad of free services for bands/artistes to promote themselves. From a free MP3 store to a gig calendar, SoundClick has made proper management of your band, quite literally, a click away. Those looking to venture further can subscribe to the site’s fee-based services, which provide even more ways to get news and works about yourself or your band out there.